Being Sunday, Nara-shi was really busy today. 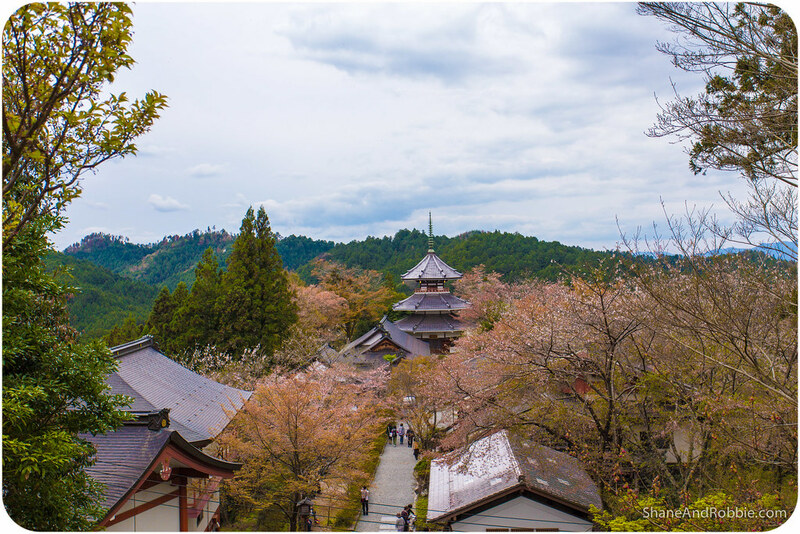 So, rather than fight with the crowds of tourists and local picnickers, we decided to go out of town and visit the tiny hamlet of Yoshino instead. 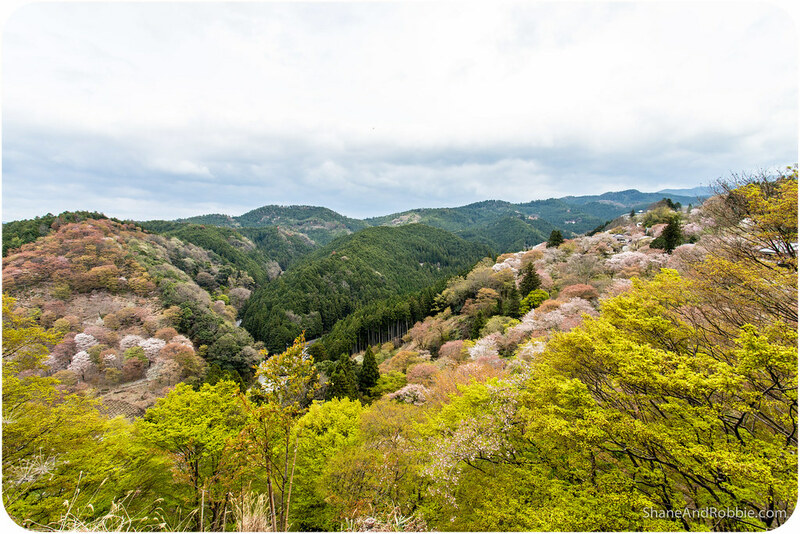 This small village is perched right at the summit of Mt Yoshino, about 80km South of Nara-shi. 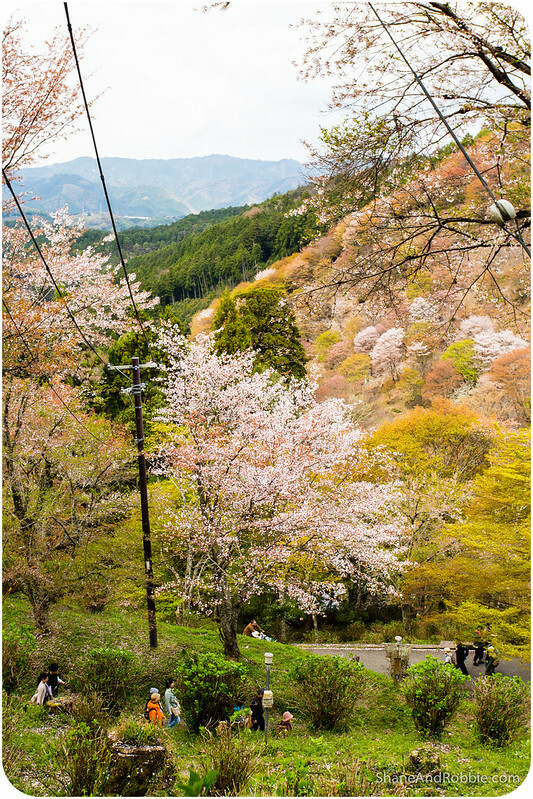 It’s touted as one of Japan’s best cherry blossom viewing spots, with more than 30,000 cherry trees planted along the slopes of Mt Yoshino and in the surrounding valleys. We love going hanami (i.e. flower viewing), and there are lots of hikes to do around the area, so this sounded like the perfect day trip. Especially for those seeking some peace and quiet…. Ha! Man were we wrong! 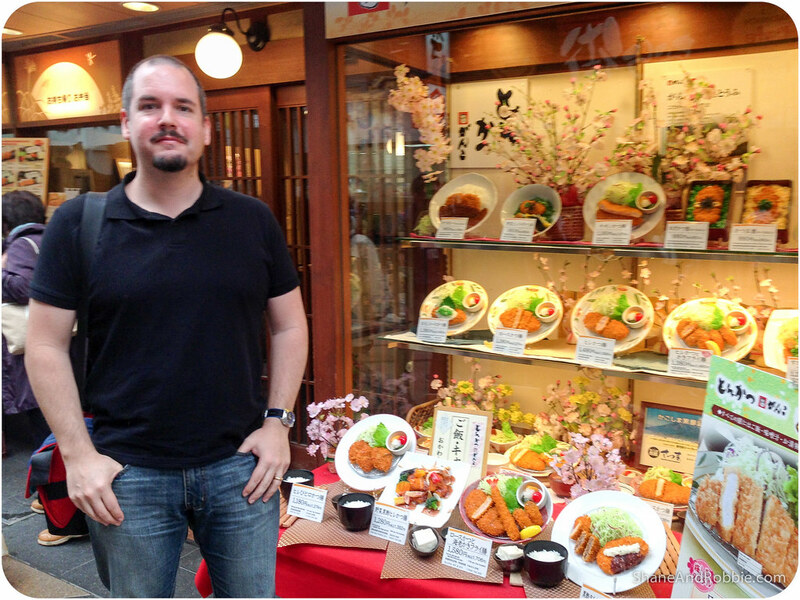 We unwittingly found ourselves in Yoshino on the busiest day of the year: the day of the Hanakueshiki Festival. 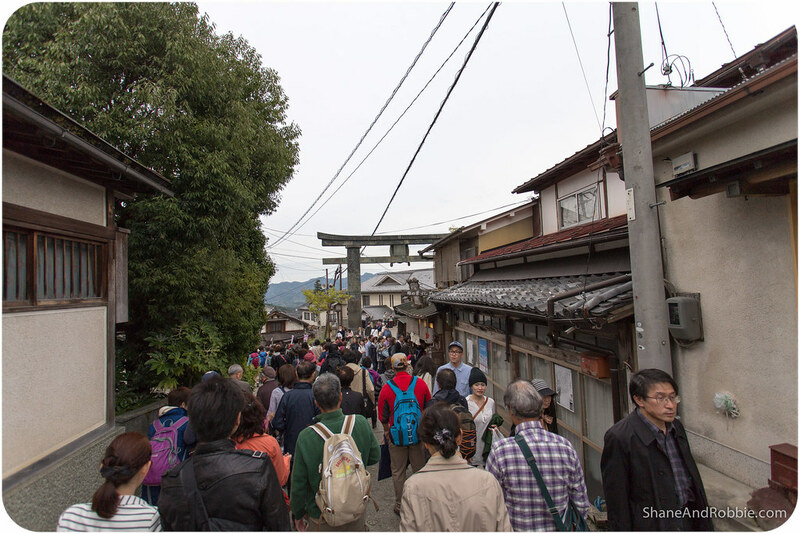 There were literally thousands of people milling around when we hopped off the train at the base of Mt Yoshino. We had no idea what was going on, but soon figured out that we were in the midst of something BIG! There were people dressed in pink everywhere and market stalls set up all along the roads; everyone seemed to be having a blast – a real festive atmosphere prevailed (that gave us a clue what was going on right there). There’s a cable car that you can take up from the train station to the village proper, but the queue was miles long, so we decided to join the other 6 million people and walk up instead. 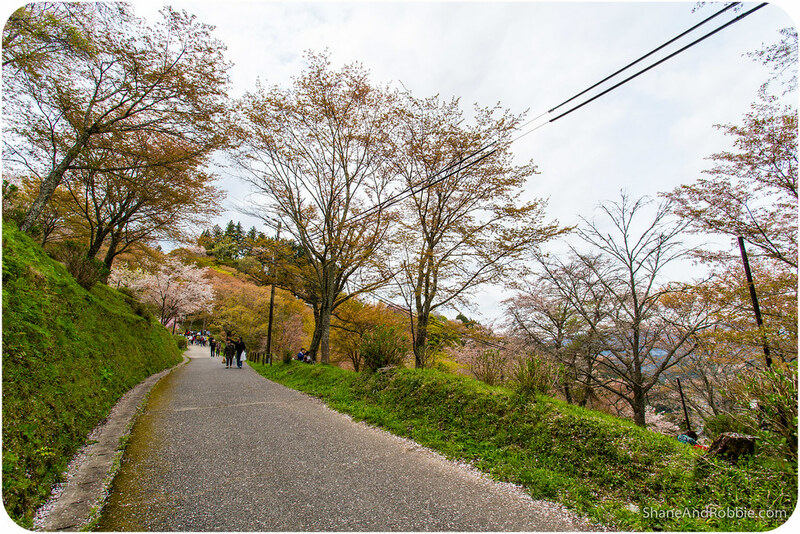 We followed the path that gradually wound its way up the mountain, admiring all the blooming cherry trees along the way. Talking to people along the way we found out that it was festival day and that the Hanakueshiki Festival is the celebration that officially announces that the cherry blossoms have bloomed. 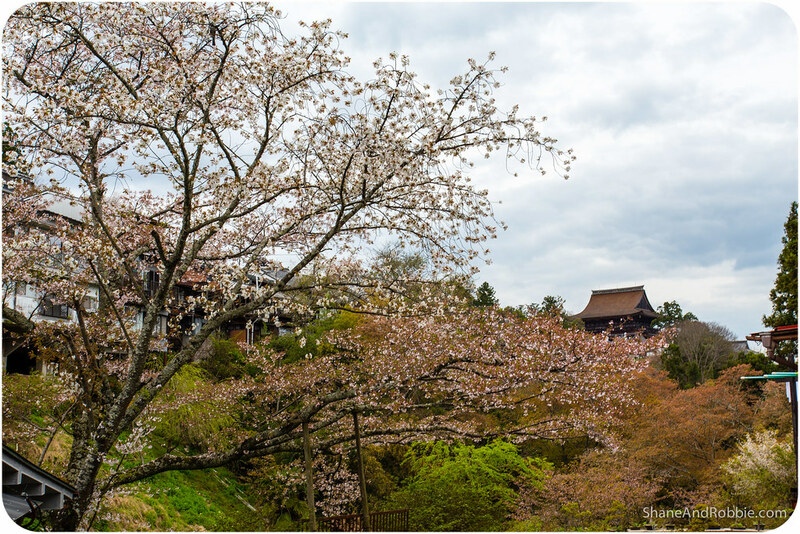 It is one of Japan’s most renowned cherry blossom festivals and has been run every April for more than 1,000 years. 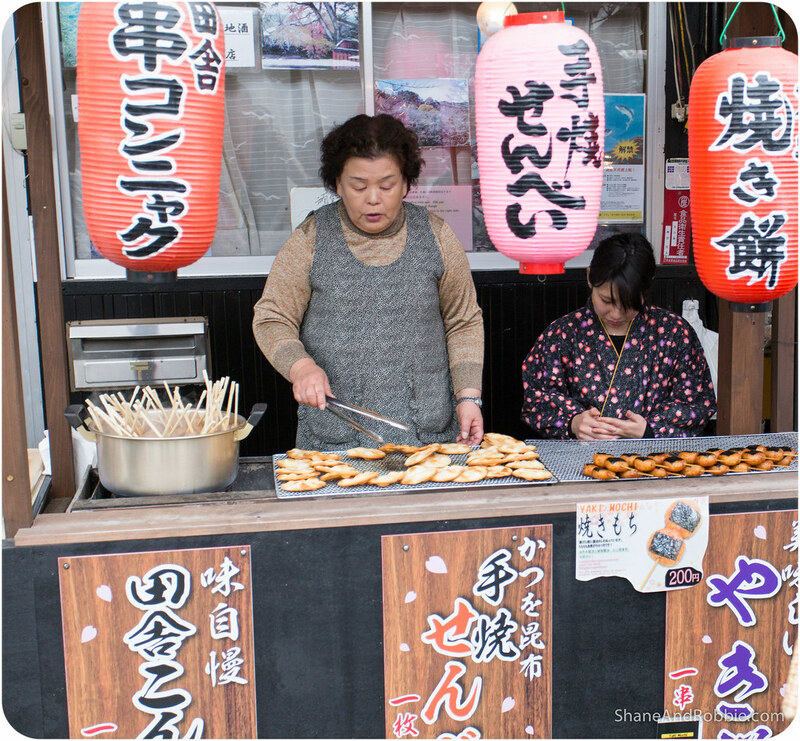 It attracts thousands of visitors, all keen to celebrate the coming of spring and to sample the various sakura-themes treats on offer. 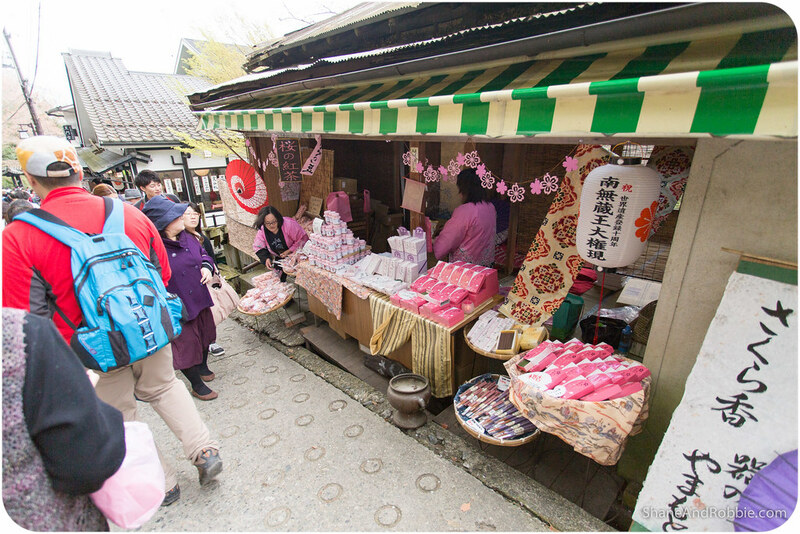 There were candied cherry blossoms and cherry blossom cakes on offer; as well as cherry blossom soaps, lotions, potions and creams. 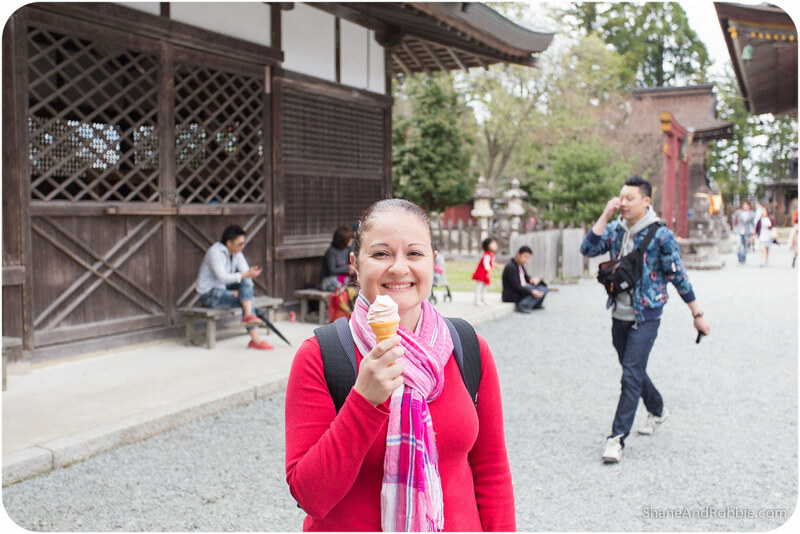 We even got to sample cherry blossom flavoured ice cream (tastes exactly like you would expect: floral and sweet – a bit like grandma’s soap). 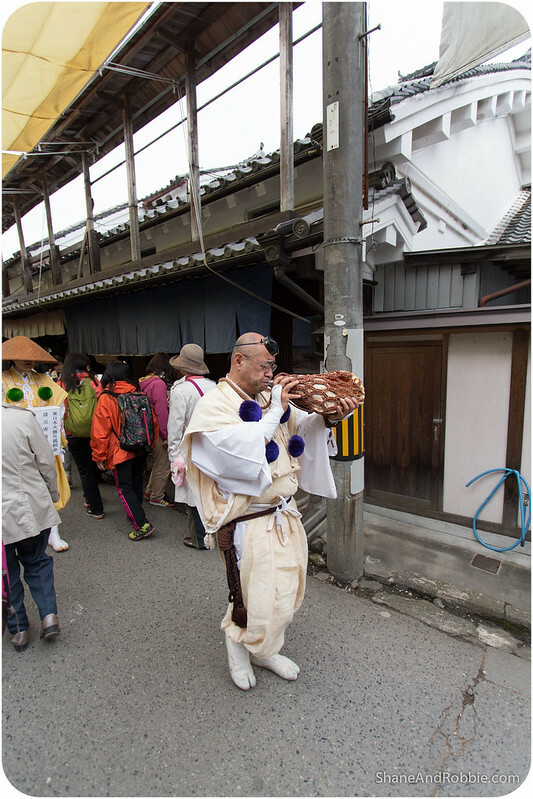 We were a little late for the main parade, but did catch the tail end of the religious celebrations: we saw priests of the Shugendo sect parading through the streets, blowing on their conch shell horns, heralding to the heavens the arrival of the sakura. 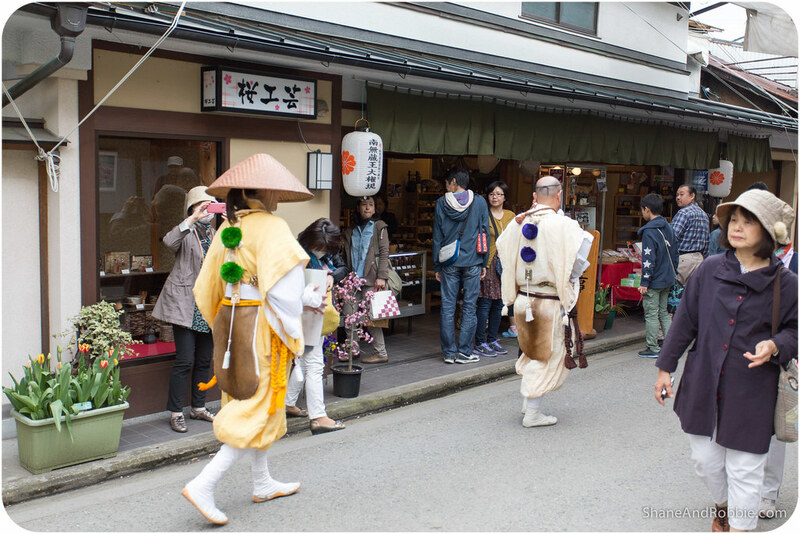 Part of the reason the Hanakueshiki Festival is so popular is that it is one of the main celebrations for followers of the Shugendo faith. 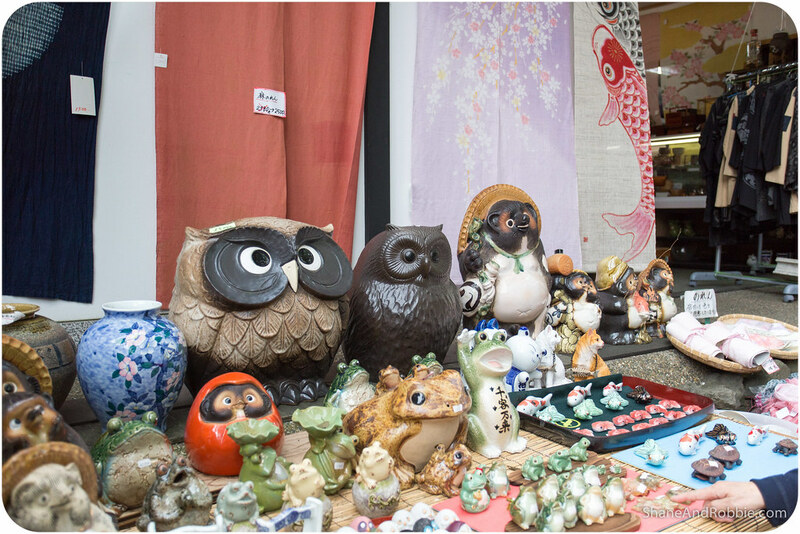 This mystical Shinto-Buddhist sect originated in pre-feudal Japan and combines old Shinto animism and nature-worship, with Buddhist ideologies. 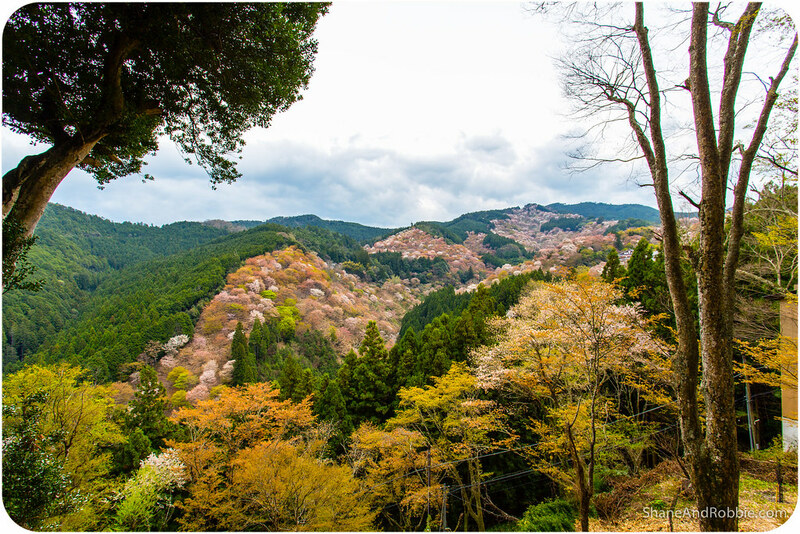 Due to the strong nature-focussed beliefs, Shugendo temples and shrines are often located in the wilderness (especially mountainous regions) and/or in places of extraordinary natural beauty. 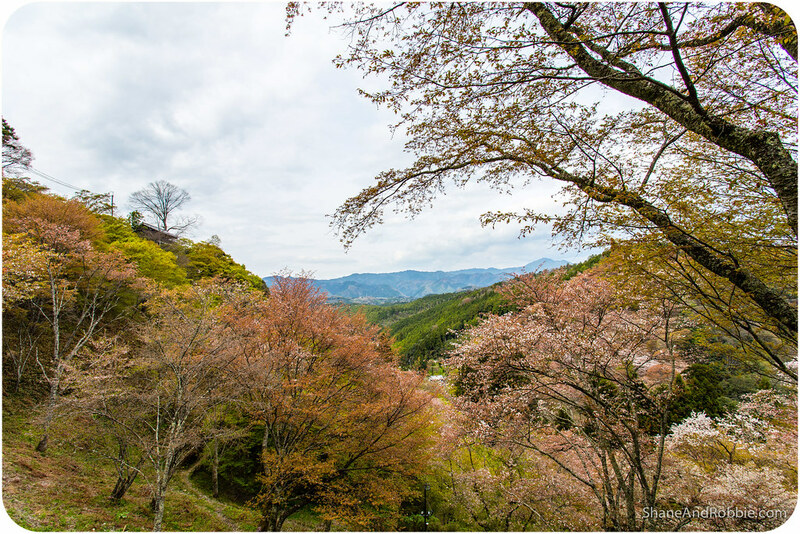 Places like Yoshino. 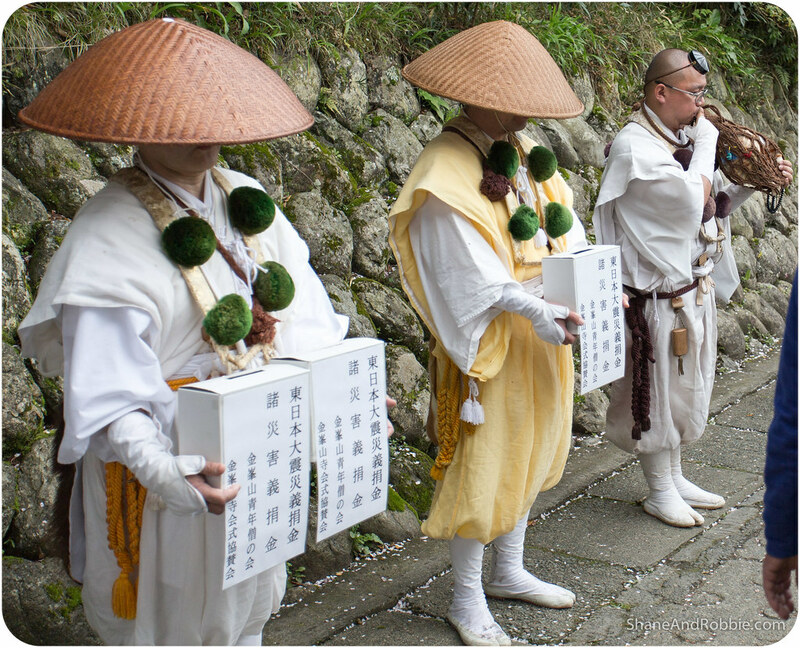 The celebrations for the Hanakueshiki Festival centre around Kimpusen-ji (i.e. Kimpusen Temple). 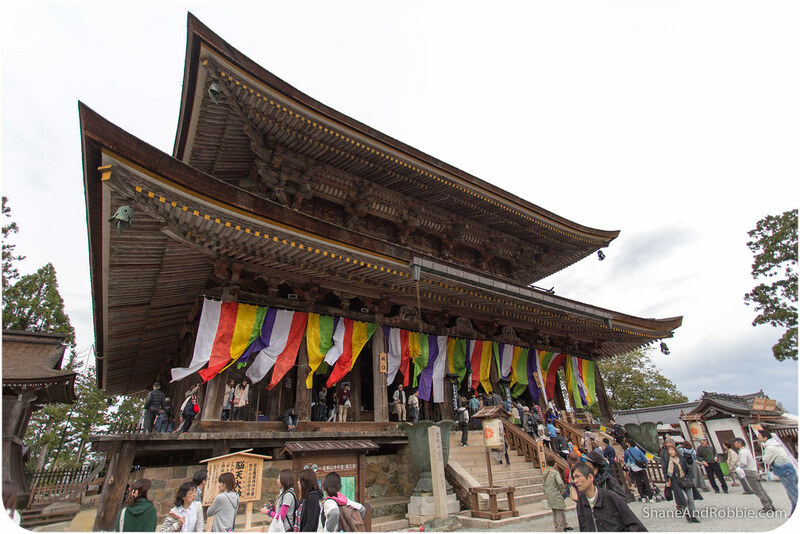 This UNESCO World Heritage listed temple is one of the main sights we wanted to see in Yoshino and it was even more impressive decorated in festivals flags and banners. Still, the view from the temple grounds across the valley was incredible. So incredible, in fact, that we were told by an elderly Japanese gentlemen that that spot is described in Japanese as hitomesenbon (i.e. 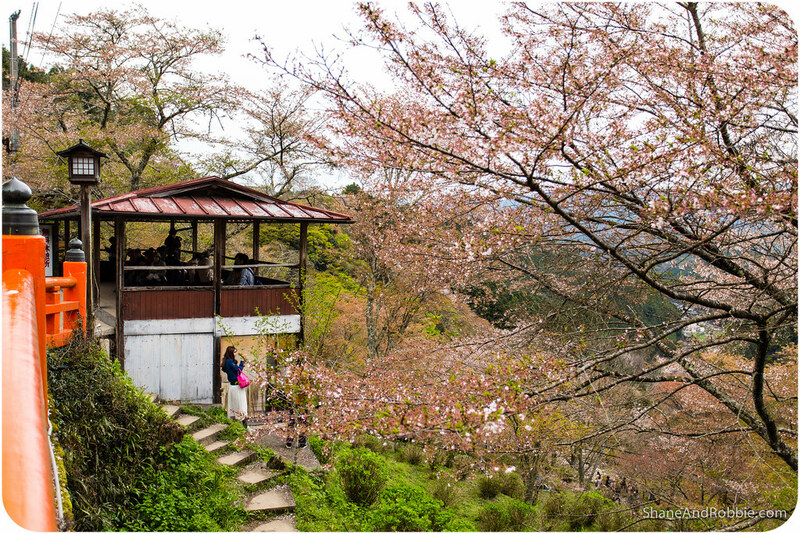 a place where one can view a vast number of beautiful cherry blossoms at a glance). Such spots are rare and highly prized, we were informed. That the Japanese even have a word for that concept is extraordinary. 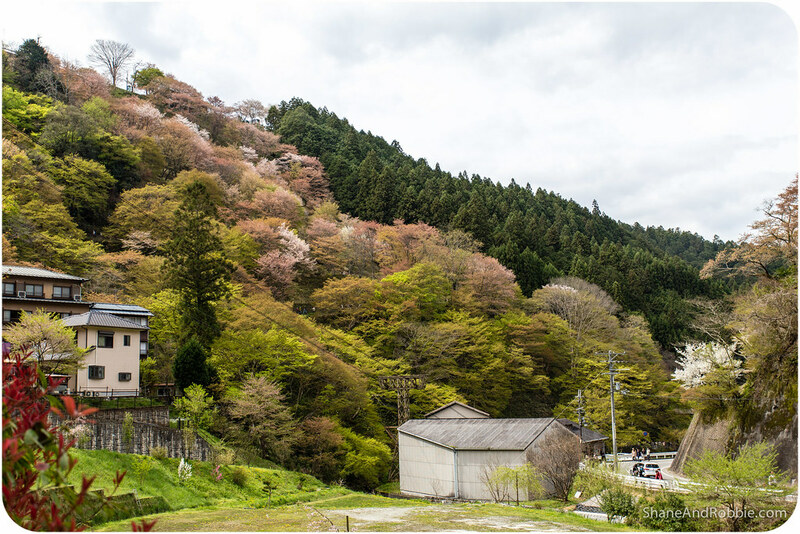 After soaking in the view from Kimpusen-ji we took our time strolling through the village of Yoshino and back down the mountain. 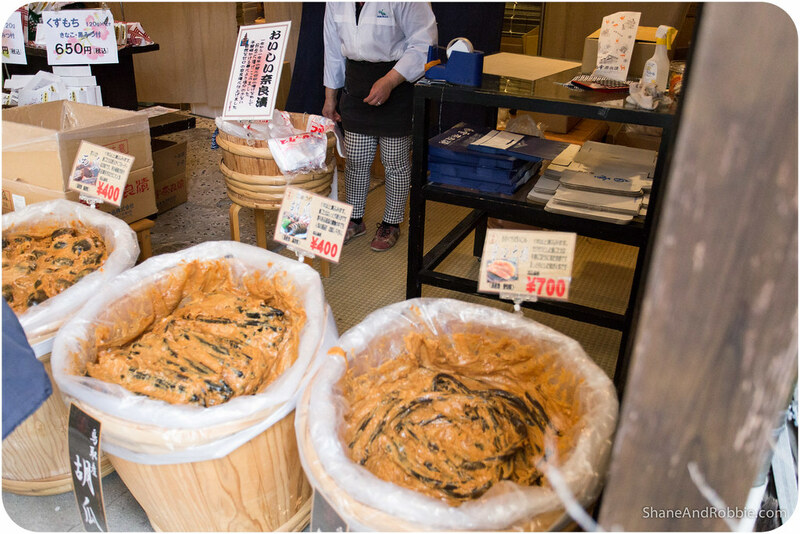 Along the way we got to see more weird and wonderful things being sold at the market stalls – including grilled whole fish on skewers, beautiful Japanese pottery, roasted chestnuts, handmade paper, and giant vats of malodorous pickles. We nibbled on a few bits and pieces, and snacked our way through the day, until we once again reached the bottom of the mountain and the train station. On the train ride home the festive atmosphere persisted, with people chatting and laughing the whole way (this is VERY unusual for Japan – most of the time trains and buses are silent). As the only gai-jin (i.e. non-Japanese people) on the train we were the centre of some speculation and attention. Finally one brave little girl came up to us and offered us some food* and asked us, in halting English, where we were from. Once they discovered we (i.e. Shane) could speak some Japanese, all restraints were off and we were part of the party. It was great! *To be precise, she offered us a small parcel of rice and raw salmon, artfully wrapped in a persimmon leaf. There is no other country of Earth where I would happily accept a piece of warm, raw fish and rice off a stranger on a train. Goodness knows how long that snack had been sitting out today, or how long ago it was prepared. But the Japanese are soooo fastidious about food hygiene that we always assume that if they’ll eat something, it’s fine. “Fine” as in hygienic, by the way; not “fine” as in yummy – some of the stuff we’ve eaten here in Japan is most definitely not suited to a Western palate.